"Sampath Speaking" - the thoughts of an Insurer from Thiruvallikkeni: Rajkot Test : Vijay ~ Pujara stand ........ poppy !!! Rajkot Test : Vijay ~ Pujara stand ........ poppy !!! To the millions of followers, there is never a dull moment in Cricket as Test no. 2232 got underway at Saurashtra Cricket Association Stadium, Rajkot. I would request my friends who do not generally read posts on Cricket to do read this one – and tell me whether they expected these to be the subject matter and not mere statistical happenings of the inaugural Test. England are no pushovers as New Zealand who caved in meekly. For Stuart Broad, this test is of added statistical significance. 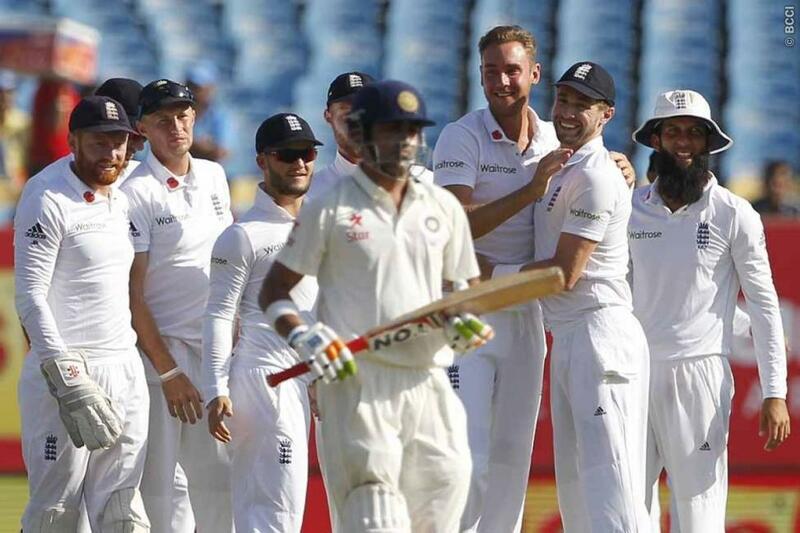 Success in India is one of the few holes in Broad's record as he stepped in to his 100th test. Stuart Christopher John Broad since 2007 has taken 360 wickets and made 2600 0dd runs. He was a member of the squad that won here in 2012 but he didn't take a wicket in the series and was hampered by injury throughout. The focus is on Saurashtra, a region located on the Arabian Sea coast of Gujarat state. It consists of 7 districts of Gujarat, including Rajkot District. It is a peninsula also called Kathiawar after the Kathi Darbar who ruled part of the region once. The place where the match is being played in a debutant ground for Tests is famous for its jewellery market, silk embroidery and watch parts. The city hosts several small scale manufacturing industries. The city is also home to one of the largest CNC machine manufacturer in the country, Jyoti CNC Automation Pvt. Ltd. Rajkot is the third largest city in the state of Gujarat, after Ahmedabad and Surat. Rajkot was the capital of the Saurashtra State from 15 April 1948 to 31 October 1956, before its merger to Bombay State on 1 November 1956. Rajkot was reincorporated into Gujarat State from May 1, 1960. Rajkot has the Alfred High School, one of the oldest institutions in India today ~ a school constructed during British rule in India by political agent Kernel Singh. This was the first English school in the saurashtra (region), which was originally called Rajkot English School was founded on October, 1853. Mahatma Gandhi had his primary education in this school. The stadium is a fair distance outside the city, on the highway to Jamnagar. A grand structure in the middle of nowhere; remote enough that as the players practise in the nets, over the wall behind them, a herd of buffaloes shuffle about, slowly, contentedly, peacefully. Cheteswar Pujara and the Rajputana twirl, Sir Ravindra Jadeja hail from here. Two major Cricket tournaments are named after men with roots in Saurashtra. The Ranji Trophy - for Ranjitsinhji who also gave cricket the leg glance; and the Duleep Trophy – after his nephew Duleepsinhji. When the game started – it was a different ball game. England batting first made a huge 537 with Joe Root, Moen Ali and Ben Stokes making centuries. Back in 2009 - 3 visiting batsmen - Tillakaratne Dilshan, Mahela Jayawardene and Prasanna Jayawardene did it at Motera in 2008-09. Way back in that England tour at Kanpur in 1961-62, Geoff Pullar, Ken Barrington and Ted Dexter struck centuries while following on. Indian reply was steadied by rock hard Murali Vijay (126) and strokeful Pujara (124). At the time of posting this, Ravichandran Ashwin just completed his 50 – India trail by 75 runs. Vijay and Pujara have been rocking – they completed 2000 runs together during their 209 run stand. 65.09 is the average partnership between them and 81.45 is Vijay’s average in first Tests of Series having scored 896 in 11 innings. If you had not observed anything in the first photo of English players celebrating Gautam Gambhir’s dismissal, see Broad’s photo closely and you would find that they are wearing something !! 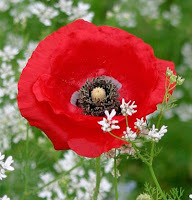 That is the ‘ remembrance poppy ’ - an artificial flower that has been used since 1921 to commemorate military personnel who have died in war, and represents a common or field poppy, Papaver rhoeas. Inspired by the World War I poem "In Flanders Fields", and promoted by Moina Michael, they were first adopted by the American Legion to commemorate American soldiers killed in that war (1914–1918). They were then adopted by military veterans' groups in parts of the British Empire: the United Kingdom, Canada, Australia and New Zealand. Today, they are most common in the UK, New Zealand and Canada, and are used to commemorate their servicemen and women killed in all conflicts. There, small artificial poppies are often worn on clothing leading up to Remembrance Day/Armistice Day (11 November) – however it is stated that most Irish nationalists and Irish Catholics refuse to wear one, mainly due to actions of the British Army. 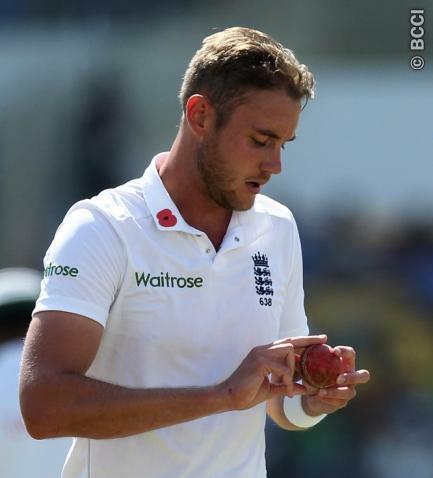 Alastair Cook's men wore the red flower symbol, which could be well observed in Broad’s dress. At Rajkot there were no issued on that but FIFA, football's world governing body, is in dispute with England and Scotland after warning they could be sanctioned if they wear poppies when they play at Wembley on Friday. Fifa doesn't allow teams to wear political, commercial or religious symbols. England and Scotland players wore black armbands bearing a red poppy during Friday's World Cup qualifying match at Wembley despite failing to get clearance from Fifa. 12th Nov. 2016 @ 13.55 hrs.